After my first tasting in 1993 at Domaine Comte Senard in Aloxe I have returned on many occasions. I have never been disappointed. Compared to other appellations I'm not a big expert on Aloxe wines, but it does seem to me that it's a particularly sauvage appellation which is difficult to tame. This can result in wines that are very foursquare and hard to enjoy. A bit like reading the work of the German philosopher Hegel. It's an education and its painful to boot. My sense is that the team at Domaine Comte Senard understand how to break in a Corton Grand Cru which includes recommending when it is opened. This Corton Grand Cru is a monopole owned by the domaine and is planted with 30 year old vines. They tend to vinify this grand cru in whole bunches and age in 50% new oak. So these are vins de garde par excellence. I bought this bottle from the domaine after an impressive tasting in November 2016. This Corton Grand Cru 2002 has a bouquet of pine forest, hawthorn, juniper and cloves. Dominated by savoury aromas it also has background cherry and damson as well as a grating of bitter, dark chocolate. The aromatic profile is fascinating and complex... juste comme il faut. There is red apple flesh, blood orange, Amarena sweet/sour preserved cherry on the palate. Wonderful to still taste the ripe 2002 fruit. Of course there is a big fence of tannins surrounding the mid-palate, its chewy and there is plenty of grip. A fiery finish. 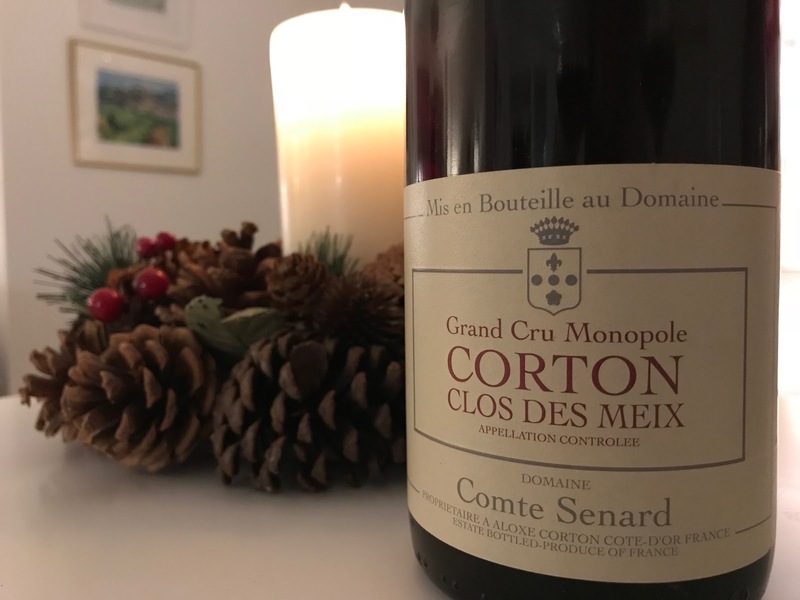 This Corton is concentrated, complex and long. Really delivers on the grand cru terroir. A huge success and a rare example of traditional Burgundian wine-making. The wine was a perfect accompaniment to a whole bone-in leg of roe deer cooked with sage, thyme, juniper and streaky bacon. Scores 89/100 reflecting the wine's characteristics, vintage and terroir quality.